Here's a quick and easy way to beat the July heat. Dial up the A/C and sign up for one of 250 MOOCs (Massive Open Online Courses) getting started this month. They're all neatly catalogued by the education web site Class Central, which also tracks the most popular MOOCS offered each month. 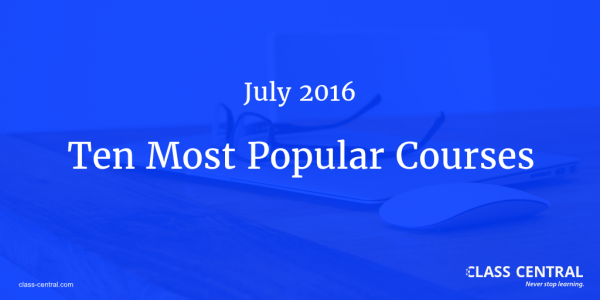 Find the 10 most popular MOOCs starting in July below. English is a difficult language to learn because of its many obscure grammatical rules, which are fairly easy to mess up--even for native speakers. Learn tips that will help you understand the rules and give you lots of practice with the tricky grammar of everyday English. A book is a tool for preserving words and images. Through books, an abundance of information, including the knowledge and experiences of the people of the past, has been handed down to the present. Explore the important roles that books have played in the cultural history of Japan. Ever wondered about the sacred scriptures that have sustained for millennia one of the oldest and most diverse religions of the world - Hinduism? Want to discover the lessons this history may offer mankind in the 21st century? The objective of this course is to provide insight into four key areas in the domain of organizational behavior: Motivation, Leadership, Teamwork, and Organizational culture. In this data science course for developers, you will learn how to create smart applications that use the power of machine learning to engage with users in previously unimaginable ways. From the personal to the political, social media conversations are at the heart of cultural and social change. In this course you will be introduced to digital methods to analyze social media data on Twitter. Have you ever wondered how you can apply math and science skills to real life? Do you wish you could go beyond what you've learned in the classroom? This science course will advance your knowledge as we unpack some important scientific thinking skills using real-world examples. This course describes Bayesian statistics, in which one's inferences about parameters or hypotheses are updated as evidence accumulates. You will learn to use Bayes’ rule to transform prior probabilities into posterior probabilities, and be introduced to the underlying theory and perspective of the Bayesian paradigm. Process mining is a new and exciting field which combines business process management with data science. Use the free, open source process mining framework (ProM) to analyze, visualize, manage and improve a range of business processes. The world and internet is full of textual information. We search for information using textual queries, we read websites, books, e-mails. All those are strings from the point of view of computer science. To make sense of all that information and make search efficient, search engines use many string algorithms. Will the # 3 above, “Hinduism Through It’s Scriptures” be offered again soon?